Specialist drainage services delivered by Lanes Group plc is helping Booths maintain its reputation as one of the most successful and best-liked food retailers in the North West of England. Co-ordinated from its Preston depot, Lanes provides a planned preventative maintenance (PPM) and reactive drainage service for Booths’ 28 stores across Lancashire, Cumbria, Cheshire, Greater Manchester, and Yorkshire. The ability to seamlessly deliver planned drainage maintenance and respond quickly to urgent issues, such as drain blockages, across the whole retail estate is key to the success of the service. 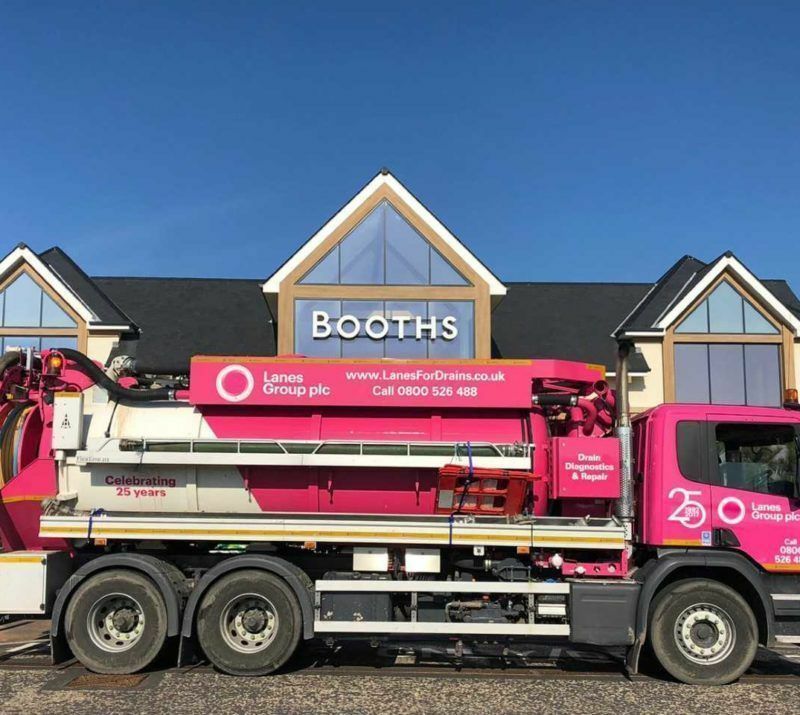 Booths also values Lanes’ ability to deploy modern specialist drainage technology, managed by highly-trained personnel, delivering high levels of assurance on service safety and sustainability. Deborah Sharples, Facilities Co-ordinator for Booths, said: “We commissioned Lanes to provide our planned and reactive drainage services nearly two years ago now, and it has been going well. Frank Hamlin, Area Development Manager for the Lanes Preston depot, said: “Lanes has HQ offices in Leeds and Manchester and has its roots in the North and North West of England, so we’re very pleased to be supporting another business, like Booths, which is so important to region. “Drainage problems, such as blockages and faulty drain pipes, can be highly disruptive in retail environments, which is why we provide a reactive service 24 hours a day, 365 days a year. Lanes can draw on resources from five depots across the Booths operating region. It uses advanced CCTV drainage survey camera systems to inspect and map underground pipe systems at Booths stores. Jet vac tankers are deployed to jet clean surface water pipes serving car parks. Smaller ‘vanpack’ water jetting and CCTV survey vans are most often deployed reactively to clear blockage problems. Frank Hamlin said: “Where necessary, we can used recycler jet vac units which can filter and reuse their water, allowing them to stay on station working for longer. As a more sustainable technology, our service is also well-aligned with Booths’ sustainability strategy. The retailer can also access Lanes’ other specialist services, including industrial cleaning and drainage rehabilitation, which includes no-dig pipe repair technologies such as point lining and full pipe lining, as well as new drainage installation. Booths was founded in 1847 by Edwin J Booth, has its headquarters in Ribbleton, Preston, and seeks to “sell the best quality food in shops staffed by first class assistants”. It is owned by the Booth family and its staff.